Rental includes a Switronix Bolt Battery Kit consists of a 7.2v lithium-ion battery and a travel charger. Designed specifically for the TL-BT200 LED light, the battery has a 6600mAh capacity and will power your light for up to 2 hours / (a bit less at max light output). The charger works with any outlet rated between 110-220 VAC. It features an LED indicator that lights red when charging and that changes to green when finished charging. Use this simple, white satin umbrella to bounce a strobe light source, or to shoot light through. Both methods will soften and broaden the light output. This umbrella is intended for use with flash sources. 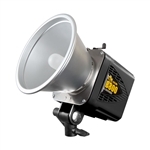 Prolonged use with constant, or modeling light sources over 250W will eventually result in discoloration or scorching. The LiteStand: medium is strong yet portable, all-metal construction, and extends over eight feet. Ideally paired with small and medium-sized soft boxes. 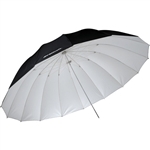 The 7' White/Black Parabolic Umbrella offers a white interior that softens and broadens bounced light. The solid black backing eliminates any potential for back spill light. Perfect for indoor or outdoor use. Save over 25% versus renting individually! *** Requires 6 AA batteries - Not included - for optimal performance we recommend the use of rechargeable nickel metal hydride (NiMH) batteries. The Manfrotto - Manfrotto 1004BAC 5/8" "Baby" Male Spigot Lightweight stand is another product innovation from Manfrotto Lighting Support. 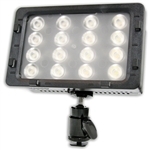 Its lightweight and compact-size makes it a practical tool for your lighting support needs. With a patented Quick Stack System (QSS) portability is the key feature. Connecting the stands together saves a lot of room while storing them in the studio. A more compact case can be used when shooting outdoors because of this unique design.